Perfect house for relaxation. 15 minutes from lovely beaches at Puerto Rico and Amadores. Great cycling up to Soria. 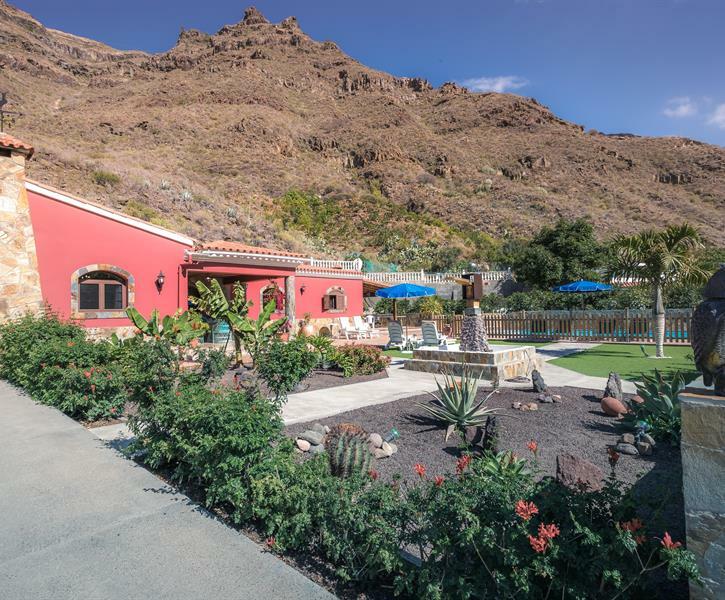 Una casa vacacional muy bonita con piscina privada en el sur de Gran Canaria. Disfruta el silencio y la belleza de las montañas. Perfecto para familias. Max 10 pers. This villa is in the perfect location, it is surrounded by mountains in a peaceful valley, yet only 15mins drive from the beaches in the South and inland walks towards the centre of the island. It is very spacious with extensive grounds of fruit tress: oranges, mangoes, avocados and bananas are growing in the gardens. Kitchen is well equipped. The owner was delightful; he checked the pool and gardens regularly, and left fresh bread and fruit for us. It was a truly wonderful holiday. Everything was better than expected from beginning till end. The agent, Ilse, received us in the airport at midnight and ensured the rental car company kept its office open for us. She had also done extra shopping to allow a loaded and ready fridge. Over and beyond the welcoming free wine and fruit which was already made available. The house and pool were in perfect order and superbly equipped. The owner checked up on the heated pool every second morning and brought us complimentary fresh bread. We caused a malfunction of the new laundry machine. The owner cared to arrange a repair on easter saturday and was hard to convince that it was our fault. We picked fresh avocados, chili and lemon in the garden, played ping-pong, had outdoor kitchen- dinner, jumped in the full size low-chlorin and clean pool, enjoyed the mountain-silence and the Spanish sun which climbed over the ridge at 10 Am and back at 7PM. The shudders and curtains provided cool and bug- free nights. Paradise exists on earth. It is named "La Finca" , 9 km's north of Puerto Rico/Arguineguin, and is greatly serviced by both agent and owner. Christian Majgaard anf family Denmark. A wonderful place, well maintained and incredibly charming self, yes I would not just call it a garden, but own orange grove and mango trees, banana trees, avocados. .. Undisturbed for tourism "masses". There has been something that we should feel welcome, which was set fruit up to us, also, there was wine, coffee, water, bread, butter, jam, so we could just manage to 1 morning. The house worked well with the kitchen and bathrooms. Efficient outdoor spaces and comfortable quiet private pool with clear and clean water. Breathtaking views of the hillsides. We have only good things to say about the place, and can only recommend it to others. Everything worked perfectly, we would like to come back.